Phil Dearden was appointed in 1981 and was Chair of the Department between 2008 and 2013. His main research interests are in conservation, particularly related to protected area systems, and he is the co-author of Parks and Protected Areas in Canada: Planning and Management, published by Oxford University Press and commonly used as a textbook on the topic in Canada. Most of Dr. Dearden's career has been spent in the tropics and particularly in Southeast Asia. He has had active research programs in Thailand for 30 years and worked throughout other countries in the region, particularly Cambodia and the Philippines. He also has extensive experience in Sri Lanka and for the last 10 years has been involved in research programs related to poverty and protected areas in Ghana and Tanzania. He is particularly interested in incentive-based conservation and working with communities to generate benefits from conservation activities. He is a member of the Community Conservation Research Network, based at St Mary’s University and a collaborator of the Centre for Indigenous Conservation and Development Alternatives based at McGill University. Most of his activity is now focused on the marine environment, both in Canada and overseas. 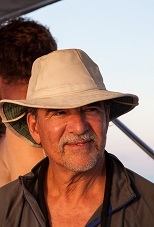 He leads the Marine Protected Areas Research Group (MPARG) at UVic and has research interests ranging from marine mammals through to coral reef monitoring, community-based governance, shark watching and SCUBA diver management in South East Asia. Professor Dearden is actively involved with efforts to improve marine conservation in Myanmar. Working with both IUCN and Fauna and Flora International (FFI) Dearden has taken part in field expeditions and led several workshops and training courses on marine conservation. He has also provided a blueprint to the Myanmar Government on strategies and actions necessary to establish a MPA system in Myanmar with special attention on the Myeik Archipelago. He was the Leader of the MPA Working Group for Canada’s Ocean Management Research Network, Co-Chair of Parks Canada's NMCA Marine Science Advisory Network and Expert Advisor to the Auditor General for the 2012 audit of MPA progress. He is a member of IUCN's World Commission on Protected Areas and has acted as consultant to the Asian Development Bank, the World Bank, IUCN, UNESCO, UNDP, CIDA, as well as many government agencies in Asia and Canada. He is a member of the College of reviewers for the Canada Research Chair Program, a past member of the SSHRC national adjudication panel on grant allocations and a Fellow of the Royal Canadian Geographical Society. A firm believer in the utility of NGOs he is a Trustee Emeritus of the Canadian Parks and Wilderness Society and currently on the Board of the Living Oceans Society. In 2011he was the Chair of the Local Organising Committee of the International Marine Conservation Congress (IMCC), the world’s largest marine conservation meeting. He is a member of an international working group funded by the National Science Foundation to develop an integrated framework to model resilience of the coupled human/natural environment in tropical and subtropical coastal systems. Dr Dearden maintains a keen interest in the designation and effective management of protected areas in Canada and is currently involved with studies relating to local communities, nationals parks and NMCAs in Ontario. He also maintains ongoing involvement in BC, especially related to the role of Indigenous and Community Conservation Areas (ICCAs). Mike Walton and Eli Enns are graduate students currently engaged with this aspect. Project IMPAACT (Improving Marine Protected Areas on the Andaman Coast of Thailand). The Andaman Bioregion of Thailand is one of the most abundant and diverse marine ecosystems in the world and is home to 18 marine protected areas. The region is a centre of tropical marine biodiversity, but the reefs and other key ecosystems are deteriorating due to a wide range of pressures. In particular, climate change will have an increasing impact on marine ecosystems in the future. At the same time there are many communities that are dependent upon marine and coastal resources for their livelihoods. These dependencies range from traditional and commercial fishing activities through to more recent dependence on coastal tourism. These activities will also see significant changes as coastal ecosystems change. The goal of Project IMPAACT is to provide further understanding of likely climate-change induced changes in coastal ecosystems and communities and suggest interventions that can increase the resilience of ecosystem conservation and the adaptive capacity of livelihood dependent communities in the future. Specific components relate to designing resilient marine protected area networks, enhancing community resilience and examining the role of diving as an incentive-based conservation approach. A new initiative is considering is looking specifically at a critically endangered species, the dugong, and how communities can become more engaged in conservation activities. Project IMPAACT has enjoyed support from a wide range of sponsors including SSHRC, the Trudeau Foundation, the Bay of Bengal Large Marine Ecosystem of FAO, the University of Victoria and more recently the Community Conservation Research Network, also funded by SSHRC. Phillippines are a global marine biodiversity hotspot, and we are involved in two projects that may help in at least slowing degradation in this critically-important area. 1. Scaling up MPAs. The Philippines has many MPAs but they are often very small, rarely in the right places and of questionable ecological value. The Philippines government, in concert with most nations of the world, is interested in expanding the marine protected area network to increase its effectiveness, but such expansions often do not take into account local stakeholders. This project is developing different models for MPA expansion built not only on ecological objectives but also stakeholder preferences. 2. Whale shark watching models. Incentive-based conservation seeks to provide incentives to local communities to protect threatened ecosystems and species. Ecotourism is often developed as one such mechanism where the goal is to make the species/area worth more as a living/functioning being than it is as a dead market product. Shark watching is one of the world’s most rapidly growing ecotourism experiences and the whale shark is the poster child and most watched of all sharks. However, the mode of interaction with the sharks and the management systems and economic benefits involved can vary greatly. This project is examining three whale-shark watching sites in the Philippines that differ in their modus operandii to help establish optimal ways to achieve benefits from this and similar activities. This project is supported by several agencies including SSHRC, the Robin Rigby Trust, the University of Victoria and RQNT (Quebec) and currently involves two graduate students, Alessia Kockel and Jackie Ziegler. In many areas where biodiversity levels are the highest poverty is a major factor in the ability to undertake conservation activities. This project looks at the relationship between poverty and protected areas in Ghana and Tanzania embracing elements ranging from governance and management through to generation of alternative incomes and the impacts of development initiatives and climate change on communities and conservation. This project has enjoyed a high level of support through SSHRCs partnership programme enabling a large number of African students to undertake graduate studies over the last few years. One student, Arthur Jones is studying under the original programme and Emmanuel Leyani is funded under new SSHRC/IDRC funding through the Institutional Canopy of Conservation (I-CAN project) based at McGill University. Dr Dearden was awarded the UVic Alumni Award for Teaching Excellence in 1998 and is a devoted teacher, having taught the first year class at UVic every year since his appointment. He is also the co-author of the text book Environmental Change and Challenge: A Canadian Perspective, published by Oxford University Press, that is widely used in introductory environmental courses in Canadian universities and now in its fifth edition. He is a recipient of the William C. Wonders Award for Scholarly Distinction in recognition of his work in the environmental and resource geography of Canada and for his efforts to communicate this to undergraduate students across Canada through publication of his widely-used textbooks In 2013 the Globe and Mail identified Dr Dearden as UVic’s “Hot Shot Prof” . He has published 13 books and over 220 scientific papers and has given keynote addresses at major conferences throughout the world, including the World Ecotourism Congress, the Canadian Parks for Tomorrow Conference and the Tropical Forestry in a Changing World Congress. In this video Philip Dearden discusses why it is important to involve local communities in conservation and what the high rate of biodiversity loss today means for the planet.